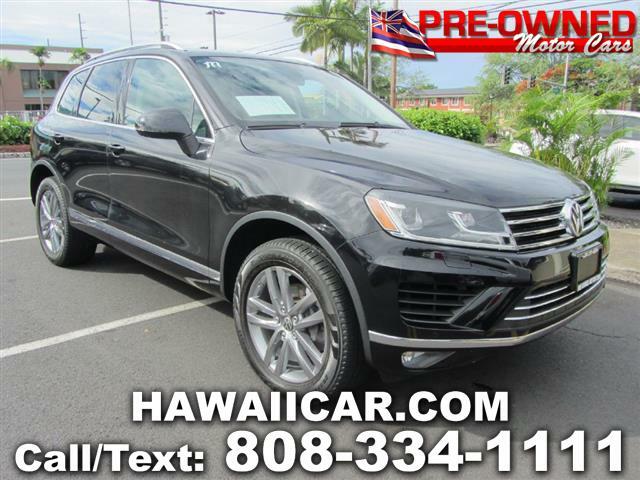 Zoom down the road in this sporty 2015 All Wheel Drive Volkswagen Touareg equipped with an 3.6-liter 280-horsepower V-6 engine with an 8 Speed Automatic Transmission. Its well equipped with features like an Bluetooth Stereo with Handsfree calling, Navigation System, a Backup Camera and more! This V6 Lux trim edition also comes with beautiful wood veneer trim accents and a big Panoramic Sunroof! Come on down to Pre-Owned Motor Cars and take this Luxurious Touareg home! Please CALL AHEAD to verify availability. Our INVENTORY CHANGES Constantly. We have the highest standards on the Big Island. Each vehicle has been thoroughly inspected. SUPPORT LOCAL BUSINESS: Buy with confidence from Pre-Owned Motorcars. We have the cleanest used cars in Kona at the best possible prices. Message: Thought you might be interested in this 2015 Volkswagen Touareg.